This is part five in a seven part resource guide for digital scholarship by Samantha Herron, our 2017 Junior Fellow. Part one is available here, part two about making digital documents is here, part three is about tools to work with data, part four is all about doing text analysis, and today’s post is focused on spatial analysis. The full guide is available as a PDF download. In what has been often termed the ‘spatial turn,’ quantitative humanities and social sciences have come to emphasize place and space in their analyses. The mass amounts of geographical and temporal data available has lent itself to new ways of imagining and visualizing global networks. Increasingly sophisticated maps and timelines are increasingly simple to make and use. Geographic Information Systems (GIS) is the field of techniques and scholarship that combines tabular data with geographical features to query, map, and visualize information. GIS technologies developed in the natural sciences to track things like weather, traffic, and disease patterns, but have moved into the humanities, enabling the spatial mapping of literature and history. At its core, GIS involves the layering of data onto maps. Interactive map of the Battle of Gettysburg. 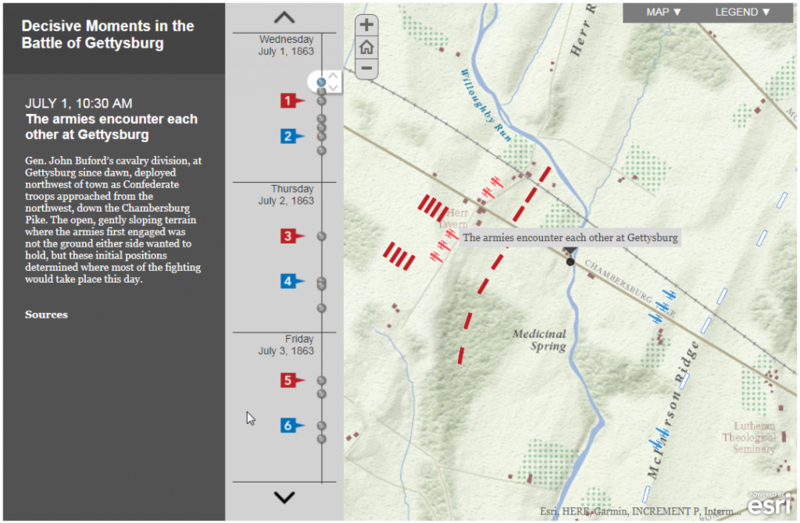 Example Professor Anne Kelly Knowles at Middlebury College, researcher Dan Miller, and cartographer Alex Tait developed an interactive map of the civil war battle at Gettysburg. Understanding the technological complications of surveillance during the Civil War, these scholars sought to represent the map of the battle narratively, through time and space, and with generated panoramas of what commanders were likely able to see on the battlefield. Example ORBIS: The Stanford Geospatial Network Model of the Roman World, a project by Walter Scheidel and Elijah Meeks, is an interactive map that allows users to, for example, input two locations from ancient Rome, select the season, a travel priority (fastest, cheapest, shortest), the modes of travel, etc. and returns the most efficient route. For more examples, see the list included here under “From the standard map to a varieties of maps” in a section of Lincoln Mullen’s Spatial Humanities workshop. The Library of Congress’ digital collections often have location metadata. For example, this collection of African American Photographs Assembled for 1900 Paris Exposition has city metadata for the photographs. Collections like this can lend themselves to mapping projects, such as in the aforementioned Photogrammar. ArcGIS is one of the most popular and sophisticated GIS tools for spatial analyses, often powering mapping projects like those above. Unfortunately, ArcGIS can be quite complicated or else too expensive for independent scholars/scholars at institutions without a license. Free, open-source options exist, however, like QGIS. Other open-source options have been indexed here. Google My Maps and Google Earth are both popular free options that allow users to upload geographic data, annotate maps, calculate distances, and display networks. Tutorials are available for both of these, as well as for accessing their APIs. Google Fusion Tables allow users to upload, view, chart, and map data–test it out with one of their example data sets, or look through the gallery. For more help and guidance about using and visualizing geographic data, check out the syllabus/lesson plans for a Spatial Humanities workshop from George Mason University’s Lincoln Mullen here. It’s excellent. Sample geographic data sets can be found here on the Resources for Spatial Humanities page of Lincoln Mullen’s workshop. This page also includes data repositories, historical maps, syllabi, tutorials, and some further reading. To transform addresses into latitude/longitude data, you will need a geocoder tool. Geocode is a Google Sheets add-on. Here is a geocoder from GPSVisualizer. The Spatial Humanities project from UVA’s Scholars’ Lab also collects ‘geospatial scholarship’ resources and gives an overview of the ‘spatial turn’ in different disciplines. Carto: Mapping software, free for some services. StoryMapJS: Free. Make maps and timelines enhanced by narrative and visual content. Media like YouTube videos and tweets can be attached to certain times and locations. Example: Washington Post, How the Islamic State is carving out a new country. Palladio: Free data viz and mapping. Google Fusion Tables: Free, see description above. Google Earth: Free, see description above. Google My Maps: Free, see description above. QGIS: Free, see description above. Data across time can also be visualized with new digital tools. TimeMapper: Transform Google Spreadsheet into an interactive timeline and map. js: Use a given Google spreadsheet template to make a sophisticated timeline. Neatline: A suite of add-on tools for Omeka, an online exhibit program. myHistro: Timeline tool advertised for archiving personal or organizational histories. Next up is a post about doing network analysis with digital humanities data. This is a syndicated post. Read the original at The Signal 2018-02-02.